DAUFUSKIE ISLAND, SC -- Sometimes you'll garner quite a bit through first impressions, and I'll admit I wasn't the least bit impressed by my first thoughts of Bloody Point. Just hearing the name conjured up images of gore that really didn't taste very good, thinking there must be a good reason for coining it the way they did. Then, upon entering the clubhouse, I noticed an oil painting depicting a battle between colonists and some outnumbered and hopelessly surprised Indians. At that point, I was waiting for Frankenstein to walk through the pro shop door -- I'd have been out of there in an instant. 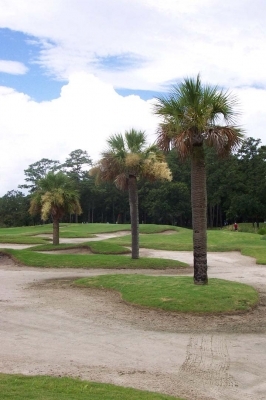 Luckily, like most knee-jerk prejudices, my first impressions of Bloody Point Golf Club on Daufuskie Island, South Carolina, turned out to be completely wrong. Bloody Point is now part of Daufuskie Island Club and Resort (A Pinehurst Company Resort, owned by Dallas based ClubCorp) -- just a short ferry ride from Hilton Head Island, and quite a distance from your usual golf outing. Most of the dissimilarity stems from its almost total isolation from 'civilization,' -- and also from its park-like layout without a house in sight. Contributing to the experience, you can't drive there yourself. First off, if you're a day guest visiting from Hilton Head or points west, you'll take a ferry to the island, then a shuttle to the course. Even if you're a guest at the beautiful Daufuskie Island Club and Resort, you won't be driving anything more powerful than a golf cart while you're there -- and you can't even take that to the course (carts aren't allowed outside the resort boundaries, and Bloody Point is 10 minutes to the south by bus). In other words, there aren't many internal combustion driven engines going in and out of the place. As a result, this Weiskopf/Morrish layout is very lightly played, ensuring an unhurried and enjoyable golf round for anyone that plays there. Bloody Point's a great place to be, and we haven't even talked about the golf course yet. 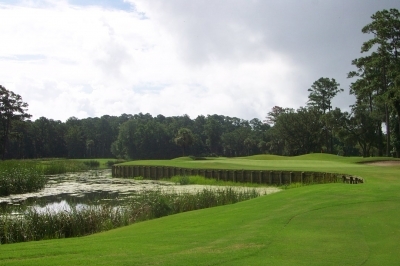 Dustin McCabe, Assistant Golf Professional for Daufuskie Island Resort, says it's exactly those 'quiet' qualities that make Bloody Point special. "Bloody Point really isn't like many courses around here -- or anywhere, really. It's a true park-like layout without and houses or condos bordering the fairways -- and since it used to be a private club with mandatory walking, there aren't even any cart paths." "We only do about 10,000 rounds a year at this course, which virtually guarantees you won't face crowded conditions here -- and when you throw in the added bonus of the scenic ferry ride over, it's pretty unique." 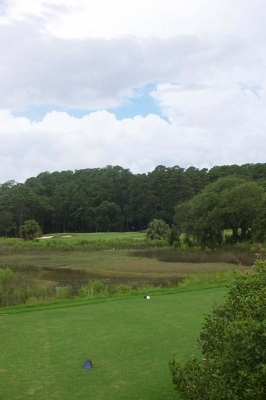 The course got its name from being built on historic Bloody Point, which legend has it was the part of Daufuskie Island where revenge-bent English settlers ambushed the warring Yemassee Indian tribe after enduring a raid on their settlements (in 1715) -- hence, the painting in the clubhouse. It's also one of the farthest points south in the State of South Carolina, just a few miles by sea to the Savannah River and the City of Savannah, Georgia. Adding to the incorrectness of first impressions, the layout is hardly bloody (or penal) at all. Since it was originally designed as a very walkable private club, the tees and greens are quite proximate to each other, and you'll usually be able to see several other holes from the one you're playing. 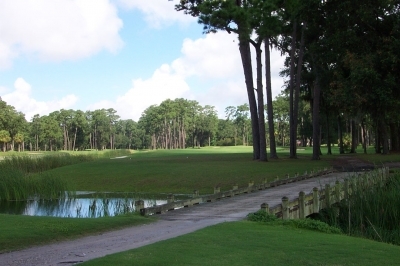 There is a fair amount of sand and water on the course, but the park-like setting will allow for a larger margin of error off the tee than its sister course, Melrose, located at the main resort center of Daufuskie Island. 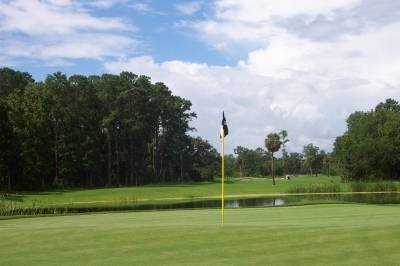 If you're ball stays clear of the carefully placed water and wetlands hazards, chances are you'll be able to play it -- even if you're closer to the next hole's green than yours. And since the course is so lightly played, you'll spare yourself a self-conscious apology for hitting your ball into someone's path on the adjoining link. Even your ego gets spared at Bloody Point. McCabe says that despite the openness and forgiving nature of the course, the putting surfaces and lengthy bunker shots will keep you honest. "Bloody Point's greens are pretty large, and appear flat, so most people think they'd be easy to putt. Well, they'd be wrong most of the time--the greens require a lot of local knowledge, a lot of paying attention to where the sun is, where the ocean is, and how the grain grows." "It all adds up to some real subtle breaks. A putt that looks flat might break three inches. And some balls may even appear to break uphill. That makes it extremely difficult for people who haven't played here much, but it's main part of the defenses on the course, so it's fair." McCabe continues: "Another difficult part of the course is the bunkering. There are some real big greenside bunkers out there, and when you couple that with the large greens and tucked pin positions, you'll get some lengthy bunker shots. Since most of us don't practice those types of shots very much, it makes it harder to get the ball up and down when you're in one." A final note before describing some of the holes -- the service is outstanding. You wouldn't think with as set-apart as this course is that there'd be someone there to cater to your every need -- and again you'd be wrong. From the moment you step onto the ferry until the time you disembark from the ride home, excellence at every turn. McCabe even moved the 18th pin position for us when we said it'd be interesting to hit to the back right corner of the green (there's a bunker in the center of the green). Now that's service for ya. Your day starts with a 410 yard, dogleg left par four. I'd recommend clubbing down here, as there are wetlands and rough long through the fairway, if you can't manage a draw off the tee. Having started out in the rough, I'll make special note that it's as thick here as I've ever seen it. For those Bermuda lovers out there, it's your paradise! You'll first see water on the left side of the third green -- and you're not so glad to notice it once you get there -- because the wet stuff'll be there quite a lot from now on. Water's very prevalent on the seventh hole, a 160 yard par three with a full water carry and no plausible bail-out considerations. It's got a three-tiered, tiny green with bunkers short-right, long left and long right. Sizeable mounds surround the green, so should you pull one severely left, it'll be quite a tough chip from the rough. Push it right and your dodging gators to swim after the ball. Nine's a good hole to try and get a stroke back -- a relatively tame 510 yard par five, very reachable in two if your tee ball avoids the parallel fairway bunkers, about 250 yards from the tee. The second shot must stay clear of a lake that hugs the right side of the latter third of the hole, but there's ample room to miss left if you'd like to go for it. While the front nine's a nice golf trip through the park, the back nine's a fair amount more spectacular, starting with number ten. 310 yards separates you from the green, and most of your view's made up of wetlands and a huge waste bunker to the right. 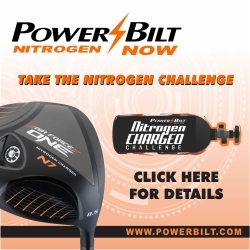 If you choose to hit driver, that will definitely bring the water on the right side into play also. I'd recommend the safe layup with an iron -- you'll still have a short iron into the green for a birdie try. Twelve, a 225 yard par three, and fourteen, a 475 yard par four, share a double green that likely won't come into play for the opposite hole. Interesting concept, and both holes are extremely well protected by sand. Here's one of those chances for a long bunker shot that McCabe talked about. 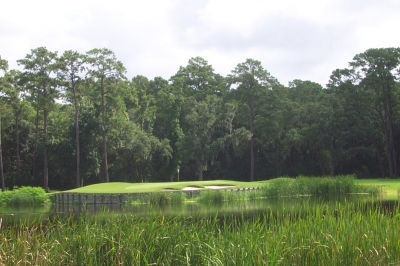 After the long and difficult stretch between twelve and fourteen, you'll get a bit of a break on fifteen -- and might even get a glance of one of Bloody Point's legends, 'Godzilla' the alligator, who patrols the pond that borders the left side of the hole. Fifteen's a 495 yard par five, pretty reachable in two with a good drive, though you'll have to carry your second shot over water and stay out of the bunkers. 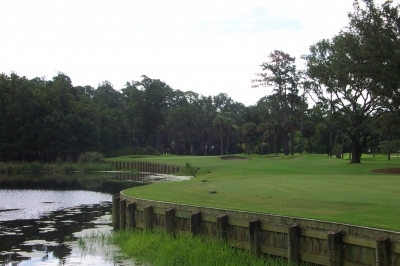 Seventeen's a beautiful par three, where you'll catch a glimpse of Mungen Creek flowing peacefully by, with Savannah in the distance. There's history, too -- the battle of Bloody Point took place in the area between the green and the water. Interesting tidbit, but no more blood on the sand -- good. Eighteen's a great finishing hole -- made even more so by the pin placement McCabe set up for us. As mentioned before, there's a pot bunker in the middle of this huge par five green, and any pin put to the right makes the challenge considerable -- because the target's not only smaller, but much less accessible. It means you probably won't get home in two, but makes for a solid challenge on the final iron shot of the day. Wrapping up, my first impressions of Bloody Point, based mostly on foolish 'what's in a name' prejudices turned out very wrong. Bloody Point's a beautiful, peaceful, parkland layout -- and contrary to its name, is very playable and enjoyable. So next time you're deterred by some irrational first impressions, think about turning yourself around -- you'll be right more often than not. Daily play: Ranges from $125 (high season) to $75 (low season). Rates include ferry ride and cart.